For my 13th birthday I invited my friends (25 including me) to go roller skating at a local roller rink. INVITES: We got jute box invitations from Party City. Inside we wrote Come to a Sock-Hop Skate of to Celebrate Emily's 13th Birthday! 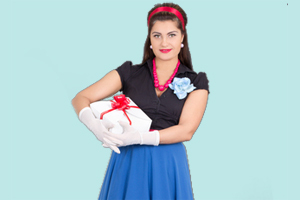 Dress in style for a 50's Party!Pizza games prizes and more!". Then we listed the information. DECORATIONS: We hung neon green pink and Blue streamers also black ones. My friend brought a disco ball and bubble machine which you can also find at Party City. We found some old records and hung them from the ceiling so they reflected the light of the disco ball. To hang them we got silver ribbon and strung it through the middle of the record. We taped the other end to the ceiling. We also strung a bunch of records on one string and put them above the entrance to the skating rink so it was like a doorway. FOOD:We had Domino's cheese pizza then got a bunch of separate ingredients so that people could make their own pizza. We also ordered a 3 foot sandwich from subway and set that out on our snack table. We also included bowls of French fries pretzels and potato chips. GAMES: For our first game we had a "Waitress relay". We divided into two teams and put a table on both ends of the skating rink (two for each team) on the close table there was an apron and a silver tray. The first player on each team had to put the apron on then hold the tray waitress style and skate over to the other end. On the far table there was a basket with a burger and fries in it (also ketchup) and a milkshake with whipped cream and a cherry on top. When the player got to the far table they had to put the food on their tray and bring it back (waitress style) to their team members. When they got to their team they had to give their food to a team member and let one person have one bite of everything. Then they take the apron off and put it on the near table and take the food back to the far table then they skate back and put give the tray to the next player. Also if you fall sown you have to clean up the mess then keep going. The funniest part was seeing the boys dress up in aprons. We also played the classic hula hoop contest (we got hula hoops from target) and bubble gum bubbles contest and a dance competition… on skates! The cake was a musical note with "Rock the Sock Hop" frosted on. "